E-series GENN E-seies Sorter is specially configured for effective and efficient sorting of food grains. Through removal of contamination and correction of discoloration, value and quality of the end product is enhanced. The food safety is also enhanced by completely removing foreign bodied and contamination before it reaches to buyers. GENN E-seies Sorter is specially configured for effective and efficient sorting of food grains. 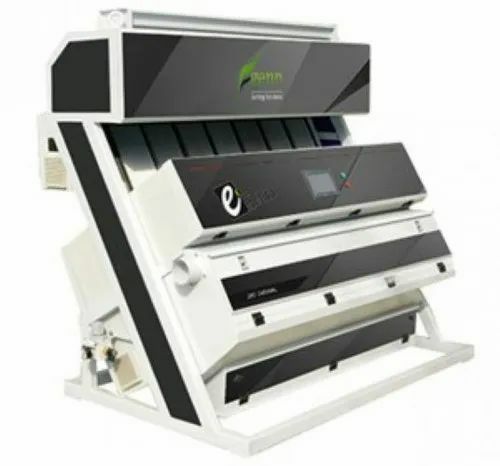 GENN E series Color sorter machine designed by us is based on latest technology. It is applicable in the food processing industry for separating unwanted particles or impurities from rice. High speed precision serviceable ejectors with 500/1000 operations per second. The special anodizing technology complies with international standards. Ultra wide channel model, to meet the large output, large quantities of sorting requirements. Bharmal Traders is established in the year 1972. We are one of the prominent manufacture, suppliers, exporters, and traders of a wide range of industrial products. Our range of products includes Industrial dryers,hot air generators,electro magnetivibrators,magnetic roll/drum comparators, dal mill machinery,motor starters,auto transformer starters and Electric Motor.These are made as per the international quality standards. Our products are fabricated using advance technology and widely used by our clients. These are known for their features like accurate dimensions, efficient, durable, corrosion to resistance and long service life. We chose our vendors through severe checking and use bets quality materials. These are used in various industrial sectors. Under the guidance of our founder, Mr. Hatim Ali has vast knowledge and experience in this field that helped us to make this organization successful and gain a lot of popularity in the market.